Acclaimed food and wine critic Dara Moskowitz Grumdahl muses on the perils and pleasures of trying to raise a creative kid for the mnartists.org e-journal access+ENGAGE. When my son was fifteen months old, I bought him his first box of crayons. I was leaving the Galleria after a business lunch, and I bought them with the typically bizarre mixture of best intentions and overwhelming guilt that seems to come with being a parent. On the one hand: What was I doing at the Galleria when I could be at home with the baby? On the other hand: I had read on the Internet that some other mother of a fifteen-month-old was already archiving her child’s drawings. Why wasn’t I archiving my kid’s drawings? How could it be that my darling didn’t even have any drawings to archive? Bad mother! On the third hand: Didn’t I want to be modeling good, strong, working-woman behavior for my little boy? And if I didn’t, what was the alternative? Modeling living-under-a-bridge behavior? On the hundredth hand: Does buying crayons for a fifteen-month-old put undue pressure on a kid, like buying an SAT prep book for an eight-year-old? Once I was in the store and surveyed the options, I had new doubts: maybe fifteen-month-olds should work, not in crayons, but with collage! Perhaps the two of us should be exploring Jean Arp‘s ideas of automatic composition and the organic beauty of chance? Don’t Arp’s collages kind of look like they were done by toddlers anyway? Or, wait: Is it wrong to buy scissors for a fifteen-month-old? It was out of just those thousand-arms of doubt and hope that Creative Kidstuff netted eight bucks for soy-crayons and paper. I would say the hardest thing about raising creative kids is that you don’t do it in a vacuum: the world intrudes. Read the rest at mnartists.org. 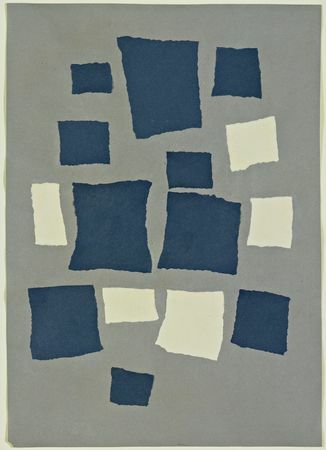 Pictured: Collage with Squares Arranged According to the Laws of Chance by Jean (Hans) Arp. 1916-17. Torn-and-pasted paper on blue-gray paper © 2007 Artists Rights Society, New York / VG Bild-Kunst, Bonn. Image appears courtesy MoMA online collection.